Booking: The A1 microscope can be booked by trained users only. 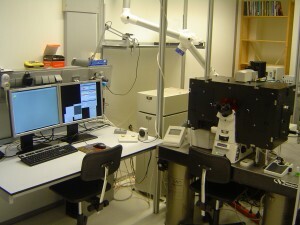 To book the microscope, Ronald Breedijk (+7860) should be contacted. The composed measurement schedule will be published in the webcalender on Thursday, the week before. For first time-users contact Ronald Breedijk (+7860). Software: Standard A1 files can be viewed with the Nikon NIS Elements (dongle required) and the free Nd2 viewer. Additional plugins can be downloaded here to import the files into ImageJ. Download an imageJ plugin (loci-tools.jar) to load Nikon tif images.